For comparability with other cities around the world, Greater Christchurch has been defined as the entire urban area extending from Kaiapoi and The Pines Beach in the north to Governor's Bay in the south, and from the coastal suburbs in the east to Yaldhurst, Prebbleton and Templeton in the west. Of the names of the 110 suburbs in the Christchurch area that have been identified to date, 29 (26.4%) can be found in Scotland or are based on Scottish family names. Of course, some of the names are used in other parts of the British Isles as well, but at least 14 of them (12.7%) appear to have a definite Scottish connection. Picture of Christchurch, New Zealand, via Wikipedia. Avondale (Shetland Islands; also Avondale House in Falkirk) but Avondale is also found in England and Ireland. The name of this suburb could well honour the Duke of Clarence and Avondale, eldest son of King Edward VII. It seems more likely, though, that it was named for the Avon River on which the suburb is situated, in which event the link is definitely with Scotland (see Avonhead and Avonside below). Avonhead (North Lanarkshire). The name of this Christchurch suburb is probably descriptive of the fact that the Avon River, which flows through the city, has its source in the neighbourhood. 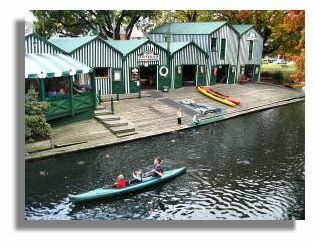 The graphic here is of the river Avon in Christchurch, NZ. 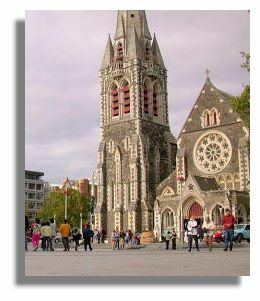 Given the strongly English history and character of the city of Christchurch, one might expect that the Avon derived its name from one of several rivers in southern England. However, this was not the case. The local river was in fact named for a river in Scotland. Local historians are in agreement that the river was named in 1848 by John Deans, a Scots farmer from Ayrshire (see the Wikipedia article on Avon River, New Zealand; also Te Ara Encyclopedia of New Zealand, Canterbury Places). Confusion surrounds the precise river in Scotland to which the name refers. Avon Water, which rises in East Ayrshire and flows through South Lanarkshire is the more likely, while the river in Falkirk (mentioned in the Wikipedia article) is probably erroneous. There are several rivers, both in Scotland and England, called Avon - derived from the Celtic word for 'river', giving rise to Welsh 'afon', Cornish 'avon' and Gaelic 'abhainn', the modern words for 'river' in these languages. Avonside (South Lanarkshire). The name of this suburb is probably descriptive of its location on the banks of the Avon River (see Avonhead above). The fact that there is a village in Scotland situated on the river's namesake in Lanarkshire may also have contributed to the choice of name. 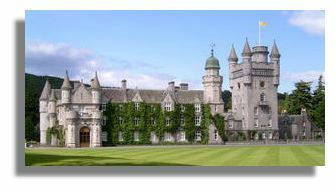 Balmoral Hill - Balmoral (pictured here) is the royal residence in Aberdeenshire, built for Queen Victoria. Burnside (two places in Angus and one place in each of Fife, Moray, South Lanarkshire and West Lothian). The following explanation of the origin of the name of this suburb is given in the Wikipedia article on Burnside, Canterbury: "Burnside was originally part of a farm, approximately 1700 acres in size, owned by a man named William Boag. It was named for the small creeks that formed the headwaters of the Waimari Stream." (article retrieved July 2007). Coutts Island - Coutts is a Scottish family name. Black (1996), the authority on Scottish family names, states that the name comes from Cults in Aberdeenshire and that it is a common name in Upper Deeside. The principal family of that name was established in the earldom of Mar in Aberdeenshire by crown charter in 1433. A family bearing this name settled in Montrose at the close of the 16th century, when William Coutts became provost of the town. The name was also common in Edinburgh in the 16th and 17th centuries. The London banking firm of Coutts & Co is now part of the Royal Bank of Scotland. According to Dymock (1994, p. 29), Coutts Island, on the northern outskirts of Christchurch, was named for Donald Coutts, an early settler. Murray Aynsley - Murray is a well-known Scottish family name while Aynsley is a family name from the Border area and is considered to be both Scottish and English. This suburb was named for the Murray-Aynsley family, prominent in local affairs during the second half of the 19th century (Christchurch Library website, article on Woolston/Heathcote Cemetery, 2006). Hugh Percy Murray-Aynsley was born in Gloucester in 1828, the son of John Murray-Aynsley of Little Harle Tower, Northumberland. He came to New Zealand in 1858 as manager and principal partner of the largest stock and station agent in Canterbury. During his career he was the member for Lyttelton in the Provincial Council and he represented Lyttelton in the General Assembly. He was also president of the Chamber of Commerce in 1862 and 1863. Riccarton, Riccarton Park and Upper Riccarton - there are places in East Ayrshire, South Lanarkshire and West Lothian called Riccarton; also Riccarton Junction in the Scottish Borders and Riccarton Mains in Edinburgh. "The Deans brothers, John and William, named the suburb after the parish in Ayrshire, Scotland, in which they were born. They were also responsible for naming the River Avon after the river of the same name in Lanarkshire, Scotland." (Wikipedia article on Riccarton, New Zealand, retrieved July 2007). Some additional information is provided in the Te Ara Encyclopedia of New Zealand entry on Canterbury Places: "Riccarton Bush (also known as Deans Bush) is the only surviving swamp forest on the Canterbury Plains. In 1843 the Deans brothers established a farm on the edge of the area, now a public reserve. The Deans's cottage (1843) and house are publicly owned." 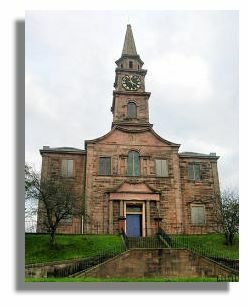 Picture of Riccarton Parish Church, Ayrshire via Wikipedia. St Andrews Hill (St Andrews in Fife and Scotland's patron saint). There are also places in both England and Wales that are dedicated to St Andrew, but the town in Fife, Scotland, is the only place in the British Isles called and spelled 'St Andrews'. Stewarts Gully - there is a Stewarton in Argyll & Bute, Scottish Borders, Dumfries & Galloway and East Ayrshire, plus numerous other place names throughout Scotland and parts of England and Northern Ireland that are based on the Scottish surname of Stewart. The Stewarts/Stuarts are descended from a Breton, Alan Fitzflaald, the crown of Scotland being brought to his descendants by Walter (1293-1326), fifth Steward of Scotland, whose son became King Robert II. The last of the Stewarts was Queen Anne (1665-1714). Strowan - there is a Strowan House in Perth & Kinross, west of the town of Crieff. The only surname similar to this quoted by Black (1996) is Stroyan from the shires of Dumfries, Wigtown and Renfrew. Black says the surname (Stroyan) is also recorded in Perthshire. Westhaven (Aberdeenshire and Angus, both spelt West Haven). It is possible that this may be a purely descriptive name, quite unrelated to any place in Scotland. Bridgend (Aberdeenshire, Angus, Argyll & Bute, Scottish Borders, East Lothian, Fife, Highland, Inverclyde, Moray, North Lanarkshire, Orkney Islands, Perth & Kinross, Renfrewshire, South Ayrshire and West Lothian). Although this name occurs widely throughout Scotland (there appear to be at least 20 places in Aberdeenshire alone), it is also commonly found in England (often spelled Bridge End) and occurs in Ireland and Wales as well. Broadfield (Dumfries & Galloway, Inverclyde, Moray and South Lanarkshire) but occurs even more commonly in England and is also found in Wales. Brooklands (Dumfries & Galloway) though far more popularly used as a place name throughout England and is also found in south Wales. Broomfield (Aberdeenshire, Angus, Fife and South Lanarkshire) but the name is used just as frequently in England and is also found in County Monaghan, Ireland. Clarkville - there is a Clark Fell in Dumfries & Galloway, Clark's Sike in the Scottish Borders, Clarkly Hill in Moray, Clarkston in East Renfrewshire and North Lanarkshire and Clarkton in Stirling. Clark occurs even more frequently in English place names. Clifton (Scottish Borders, Orkney Islands and Stirling) but found far more frequently throughout England. Linwood and North Linwood - there is a place in Renfrewshire with the name Linwood, but this name is also found in England. Dymock (1994, p. 65) attributes the name to a property in the area. Middleton (Aberdeenshire, Angus, Argyll & Bute, Dundee City, East Renfrewshire, Highland, Midlothian, Moray, Perth & Kinross, North Ayrshire, Renfrewshire and Stirling) but just as commonly found throughout England and is also found in Wales. Mount Pleasant (Aberdeenshire, Argyll & Bute, Scottish Borders, Dumfries & Galloway, East Ayrshire, Fife, Highland, Moray and the Orkney Islands). However, Mount Pleasant occurs widely throughout England, Ireland and Wales, as well as Australia, Canada and the USA it would seem, making it one of the best travelled place names in the English-speaking world. Spencerville - there is a Spencerfield in Fife but Spencer, being an English family name, is encountered far more frequently as an element in place names in England. Taylors Mistake - Taylor is a very common surname in both Scotland and England. A survey of surnames undertaken in the 1970s suggests, however, that it is the 5th most common surname in England compared with the 14th in Scotland. Templeton (Aberdeenshire, Angus and South Ayrshire). Templeton is also found in England and Wales. A final category of suburban names comprises places that can be found in Scotland but which, in Christchurch's case, definitely or most probably have no connection with Scotland. Heathcote Valley (Heathcote in Aberdeenshire) also three places in England. The suburb was named after an Englishman, Sir William Heathcote, secretary of the Canterbury Association (Wikipedia article on Heathcote Valley). St Martins (Highland; also East Renfrewshire, spelt St Martin's) but the name is also found in southern England. The article on St Martins in Wikipedia states that the origin of the name is unclear. One plausible explanation is that it was named after St. Martin's Hall in London, where a gathering had taken place immediately before the departure of the Canterbury settlers. Alternatively, the suburb may have been named for an area with which the original owner of the holdings (Henry Phillips) was associated. A Scottish connection therefore seems improbable. Northeastern suburbs: Avondale Park (Avondale), Macfarlane Park (Shirley), McVicars Plantation (near the Windsor Golf Course) and Petrie Park (Richmond). Northwestern suburbs: Avonhead Park (Hyde Park), Burnside Park (Burnside), Crosbie Park (Hyde Park), Edgar Macintosh Park (Papanui), Ferrier Park (Avonhead), Grant Armstrong Park (Bishopdale), McLeans Grassland Park and McLeans Island Recreation Area (both NW of the airport), Owen Mitchell Park (Northcote), Riccarton Bush (Riccarton) and Upper Riccarton Domain (Upper Riccarton). Southeastern suburbs: Avon Park (Avonside), Curries Reserve (Hillsborough), Douglas Scenic Reserve (off Dyers Pass), Garrick Memorial Park (Woolston), Mary Duncan Park (Hillsborough), McCormacks Bay Reserve (Balmoral Hill), Scott Park (St Andrews Hill), Scotts Valley Reserve (Heathcote Valley), Scott Scenic Reserve (Summit Road) and Thomson Park and Scenic Reserve (Summit Road). Southwestern suburbs: Kyle Park (Hei Hei), Leslie Park (Islington), Muir Park (Halswell), Scott Park (Oaklands) and West Watson Park (Hillmorton). Dymock, Gil (compiler) (1994). AA Concise Dictionary of New Zealand Place Names (Moa Beckett Publishers Ltd, Auckland). Christchurch City & Kaiapoi Map, not dated (Kiwimaps Ltd, Christchurch). Greater Christchurch Map (1998). New Zealand Automobile Association Inc.
Te Ara Encyclopedia of New Zealand, Canterbury Places. Wikipedia article on Suburbs of Christchurch, New Zealand.